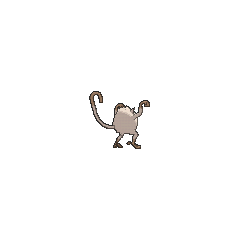 Mankey in game: 3,122 Who? Important notice! Pokemon Mankey is a fictional character of humans. Mankey is a primate Pokémon, similar to a New World monkey. 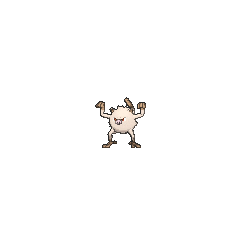 It is a bipedal Pokémon with a round body covered in whitish, shaggy fur. Its nose is similar to a pig’s snout, and it has red eyes and triangular ears with brown insides. Mankey's hands, two-toed feet, and the tip of its curved, prehensile tail are brown. Along with Stufful, it is the smallest Fighting-type Pokémon. 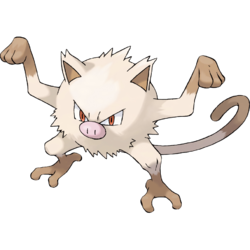 Mankey specializes in physical fighting, and is very aggressive and short-tempered. When angry, Mankey begins shaking and its breathing turns rough. Its rage peaks quickly, preventing its victim from being able to flee. If Mankey loses sight of its colony, its loneliness causes it to become infuriated. Mankey can be found in the mountains. 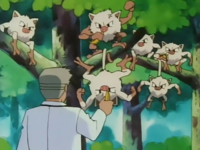 Mankey lives in treetop colonies, and if one becomes enraged, the whole colony rampages for no reason. According to the Pokémon Mystery Dungeon: Red Rescue Team and Blue Rescue Team games, Mankey's preferred food is chestnuts, although Mankey usually lacks the dexterity to peel them. Mankey will get agitated and rage after attempting to peel a chestnut's spiky shell. Additionally, it also appears to be fond of bananas in the anime. In Primeape Goes Bananas, a wild Mankey stole Ash's hat and then evolved into a Primeape. Ash captured it shortly afterward. In Training Daze, a Mankey jointly under the ownership of Jessie and Jubei was used at the Team Rocket Academy for a test. It lowered Jessie into a vault containing an Articuno statue, but due to the rope getting stuck, Mankey and Jubei had to pull Jessie and the statue up; proving to be too heavy, they dropped it, triggering the alarms and resulting in Mankey and Jubei being injured. Mankey's debut appearance was in Pokémon - I Choose You!, as a group of Mankey were passing by and witnessed a flock of Spearow chasing after Ash and Pikachu. 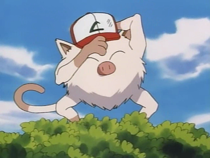 Mankey also appeared in The Kangaskhan Kid. Mankey appeared in a picture in Pokémon Paparazzi. A Mankey made an appearance in The Breeding Center Secret. Multiple Mankey were among the Pokémon seen at Professor Oak's Laboratory in Showdown at the Po-ké Corral. A Mankey under the ownership of an unknown Trainer, appeared in Friends to the End, during the closing ceremonies of the Indigo League. Mankey also appeared in Pallet Party Panic, at a party among other Pokémon. A Mankey was among the Pokémon controlled by Cassidy and Butch in Pikachu Re-Volts. Multiple pink Mankey resided on the Pinkan Island in In the Pink. A Mankey, under the ownership of an unnamed Trainer, was treated by Nurse Joy in The Joy of Pokémon. Multiple Mankey were part of an exhibition in Flower Power. In the third Pokémon Movie, Spell of the Unown: Entei, a Trainer named Lisa used a Mankey to battle Ash. Two Hits and a Miss featured a Fighting-type dojo where one of the many Pokémon was a Mankey. 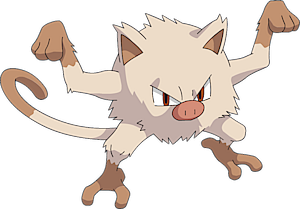 A Mankey was one of the Pokémon part of a tropical jungle in A Hot Water Battle. Multiple Mankey also appeared in Celebi: Voice of the Forest. A Mankey was one of the inhabitants of an oasis just for Pokémon in Got Miltank?. A Mankey was one of the Pokémon seen at Chuck's Gym in Machoke, Machoke Man!. A Mankey was one of the Pokémon seen in a forest outside the Ice Path in EP250. A Mankey was seen in the wild in The Legend of Thunder!. A Mankey was one of the inhabitants of the Dragon Holy Land in Fangs for Nothin'. A Mankey appeared in the opening of Lucario and the Mystery of Mew. A Mankey appeared in The Saffron Con as a Pokémon owned by a Coordinator. It also had a minor appearance in Pokémon Ranger and the Kidnapped Riolu! (Part One). Two Trainers' Mankey appeared in SM006. 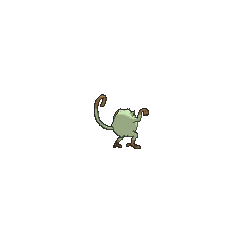 Mankey first appeared as a silhouette when Green explains about Mew in The Jynx Jinx. A pack of Mankey, led by an enraged Primeape, attacked Blue and Yellow in The Primeape Directive, but his Porygon managed to defeat it. Yellow was the one to quell the leader and have them leave peacefully, however. They later appeared in The Legend after the industrial ruins in the Kanto mainland had been restored by the healing light. The more Mankey in the puzzle area, the more damage.